When replacing hinges and latches for walk-in refrigerators it is important to get an exact or comparable replacement part. The back of the part will stamped with a series of numbers and letters called a mold number. The back may also read “flush” or have the offset size (e.g. 1-3/4″). It is important to have that number on the back to ensure you get the proper replacement. Additionally, having the serial number of your walk-in (often located in the door jamb on the hinge side or in a corner inside panel) can be a huge help if you’re ordering the replacement part from the walk-in manufacturer or your parts supplier. Call the walk-in manufacturer or get the mold number off the back of the part. 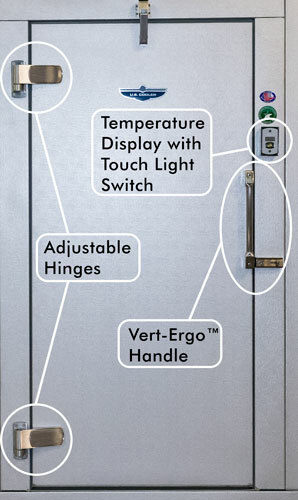 Walk-in cooler and freezer hinges are either flush or offset. The easiest way to determine which style you have is to place your hand on the outside wall of the walk-in and slide it towards the door. If the door stops your hand from moving across the door, then you have an offset door. If your hand slides across the door, it is flush. 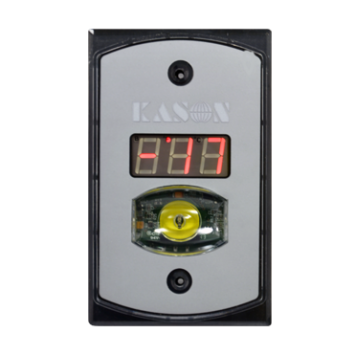 Determine the offset measurement by measuring from the wall surface to the door surface. The offset measurement combined with the mold number on the back will ensure you receive the correct hinge. If the temperature in your walk-in cooler or freezer is not optimal for the type of products you are storing, it can lead to spoilage or the spreading of food borne illnesses. Thermometers are a very important indicator to tell if your walk-in is maintaining your desired holding temperature properly. However, thermometers don’t always give accurate readings, so it’s a good idea to verify that they are working correctly from time to time. When the thermometer for your walk-in cooler or freezer left the factory, it was calibrated to be accurate within one degree of the actual temperature. However, the thermometer may have been mishandled in transportation, or it may have lost its bearings over time; so it’s always a good precaution to test the reading against a known standard such as melting ice water. If the reading is incorrect, you will need to calibrate it. 1. Remove the lens to expose the pointer by un-threading counterclockwise (threaded lens) or by carefully prying (press-in lens) the lens away from the case using the molded slots. 2. Fill a glass or insulated mug with crushed ice and add water. Stir the glass and let it sit for 5 minutes, until all the ice is melting into the water. 3. Check the accuracy by inserting the temperature sensitive probe into the center of the cup of melting ice and water (32°F, 0°C). Keep it there for at least 30 seconds and take it out when the pointer has stopped moving. If your thermometer does not read 32°F, ± 2°F, continue onto step 4. 4a. If the temperature reads high: Stabilize the pointer by placing a finger next to the left side of the wide end. Insert a screwdriver into the slot in the pointer hub and carefully turn the hub clockwise until the desired setting is reached. Your digital thermometer should have a reset button or a recalibration screw. But others have evolved with their various industries, and Kason must keep up with those trends. “The tricky part of our business is knowing our customer applications,” he reveals. For example, when the blowing agent used in insulating foam panels for walk-in refrigerators and freezers changed for environmental reasons, the fastener holding that foam had to evolve. There are various mounting styles of gaskets used in manufacturing walk-in coolers and freezers. 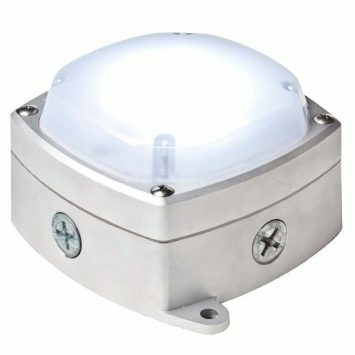 Some are secured with screws, stapled onto a flat surface, or cemented into a channel. 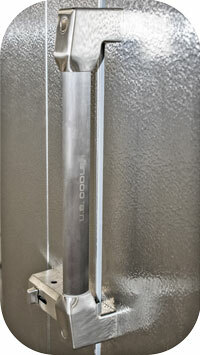 U.S. Cooler chooses to use magnetic dart style gaskets that push into a groove. The causes of gasket failure are numerous, from loss of vinyl elasticity over many years to an employee ripping the gasket by running into it with a cart. If your gasket is building up ice or condensation, that’s a sign that your seal is not tight and you need a replacement gasket. Installing replacement gaskets correctly is important to ensure a tight seal with no air infiltration or icing along the door frame. Soak the gasket in warm water for several minutes in increase pliability. Remove door from walk-in cooler/freezer (some hinges have lift-off capability when the door is open) and place on a pair of saw horses or table with gasket side up. Using a screw driver, remove the 7 screws from the inside edge of the old gasket if they were installed. (NOTE: some types of gaskets are not screwed in). After old gasket has been removed place new door gasket around door, laying it out across the top and down the sides of the door. With door gasket in position around the door starting at the top corner, firmly seat the spur of the door gasket into the groove of the extrusion along the edge of the door using a hammer. It’s important that the spur be positioned over the groove correctly as it needs to be seated on the first impact of the hammer. Continue along the top of the door seating the gasket and then down the sides until you get to the bottom of the door. Trim the bottom of the door gasket so it just covers the metal strip of the door sweep. It should not extend onto the rubber part of the door sweep. If the gasket is trimmed, remove the rubber plug from the trimmed piece and insert it into the bottom of the gasket to keep the magnets in place. Use NSF approved silicone caulk to keep the rubber plug in place. Using a screw driver, install 7 screws into the locations shown on this drawing. Re-install door onto the hinge blocks on the walk-in frame and check door for proper operation. 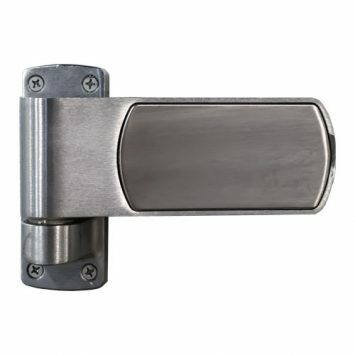 You can buy name-brand walk-in parts such as gaskets, handles, and door closers from walkincoolerparts.com. Walk-in Cooler & Freezer Parts has the lowest prices on the net and will ship most orders the same or next business day. Has your walk-in cooler or freezer seen a lot of use and abuse over the years? Door parts on walk-ins are particularly susceptible due to heavy traffic and may become worn or break. In the past we have exclusively provided walk-in parts for our units by calling our parts line 866-261-2797 (8-5PM CST). U.S. Cooler is proud to announce the launch of our new parts website walkincoolerparts.com. The site will allow you to create an account and save items in your cart to be purchased at a later date. It also offers the convenience of 24/7 ordering, free shipping, secure checkout and no minimum purchase amounts. Currently, our online catalog only offers parts that are standard on U.S. Cooler walk-ins. These include cam locks, closers, gaskets, handles, hinges, light fixtures, screed and more. In the coming months, we will begin adding additional items to our catalog encompassing parts that require specific sizing or aren’t found on U.S. Cooler manufactured units. Walk-in Cooler Parts accepts Visa, Discover, and MasterCard. Appropriate sales taxes will be charged for shipments to California, Georgia, Illinois, Michigan, Missouri and Texas.